Cinematographer Chad Wilson joined Director - Producer James Moll and Director of Photography Harris Done on this Emmy winning project. 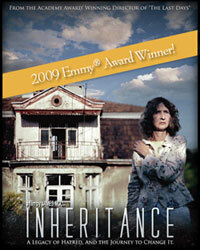 Inheritance is a feature documentary about the psychological legacy bequeathed by a prominent Nazi leader upon his daughter. Filmed in Germany, Poland, and the United States, the project aired on the PBS series POV and is available on demand.